And Song of the Year (Cruella De Vil)…. 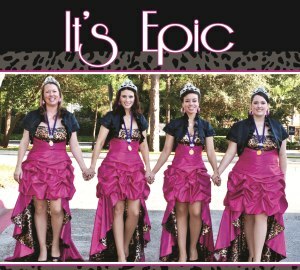 Click on the cover of the It’s Epic album to hear preview tracks! We are very proud to introduce our debut album, featuring a jam-packed, 14-song line-up. From traditional barbershop arrangements to contemporary pop songs, It’s Epic has plenty to entertain music lovers of all kinds. This album was made possible by our generous Kickstarter project supporters and our barbershop “angels.” We belong to a beautiful, loving barbershop family and we are so grateful for their love and support. Two easy ways to order… do you want a physical CD or do you prefer a digital download of the entire album?